Breastpads : Welcome to Sheepish Distribution!, All Natural Care Products! Our thinnest breastpad is made with super absorbant Organic Bamboo Velour backed with a layer of organic cotton/hemp. 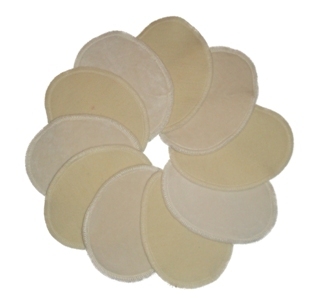 These pads provide superbly discrete protection and softness. Machine washable, tumble dry. Our thinnest breastpad is made with super absorbant Organic Bamboo Velour backed with a layer of organic cotton/hemp. 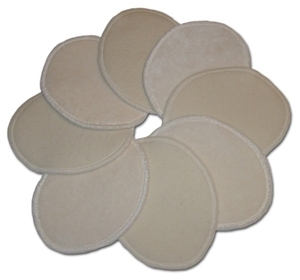 These pads provide superbly discrete protection and softness. Now in all black from our elegance line! No more white peeping through a dark color or black top! Machine washable, tumble dry. Our everyday, affordable washable breastpad. Made with two layers of Organic Cotton/Hemp blended fleece serged together to form a soft, absorbent, washable breastpad. Reliable with easy care - simply toss in the washer and dryer with your next load of laundry! Now in all black from our elegance line! No more white peeping through a dark color or black top!